We undertake a large amount of sheetmetal fabrication for shop fittings including decorative metalwork, counters, shelving and display stands both in stainless steel and with powder coated finishes. We have experience both in working direct for the customer, including design services, as well as subcontracting for interior designers and shop fitters on larger projects. Our work includes out of town shopping centres, petrol stations, high street outlets and small independent shops. We pride ourselves in being able to handle any requirement and being able to assist the customer at every stage. 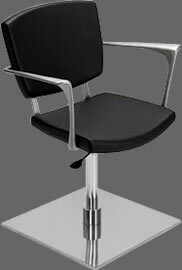 A large part of our work is for the hairdressing sector in which we have have considerable experience designing hairdressing styling units and hydraulic chairs as well as general accessories such as mirror stations and hairdressing furniture to specific requirements. Special displays can be fabricated quickly for promotional point of sale work. We can offer low cost structures and frameworks to order and are happy to work with marketing consultants, printers and PR agents as required.